Snow bands will thin Saturday morning as temperatures increase, but a strong wind will continue to blow from the northwest. That major storm is pulling away this morning. 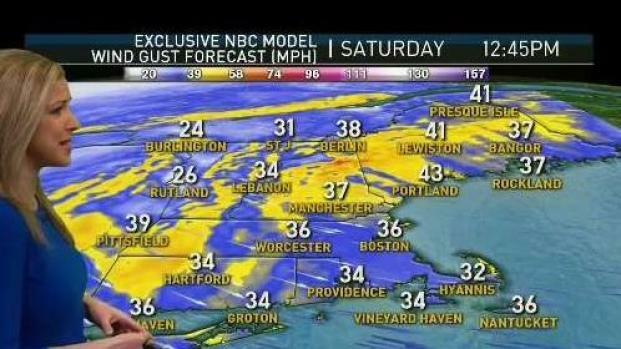 With the central pressure down to 28.88 inches, this was one of the strongest storms to impact New England this year. We did not have quite the same wind as that February 25 storm. That’s because the pressure gradient is not quite as strong; the high-pressure system to our west was weaker this time. The last of the snow bands are thinning and lifting out quickly Saturday morning. The wind has ramped up from the northwest, gusting past 45 mph. And the temperature is climbing out of the 30s to the lower 40s. Any dustings of snow will melt very quickly. But it’s a totally different story in the hills and mountains where more than a foot of snow fell at the ski resorts. Summit wind speeds may cause a lot of the wind holds Saturday, and temperatures will be in the 20s. Saturday: Early AM snow showers depart for some sun and wind, highs in the 40s. 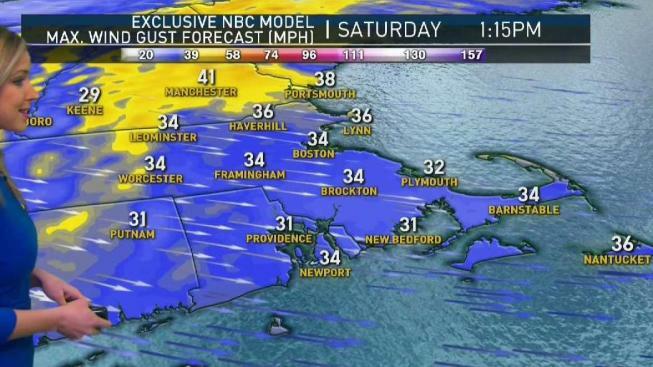 West gusts 40-50 mph. Overnight Saturday Night: Breezy, clear. Low of 34. Sunday: Pleasant sun, highs 55 to 60. Saturday night we are all mostly clear and comfortable with the low in the 20s and 30s. High pressure to our south Sunday sends some warmer air in, mostly sunny skies south and fading sunshine north. High temperatures will be in the 40s and 50s. But even as it warms up there’s a new cold front coming in from Canada, and it may end up snowing in the mountains of far northern Vermont and New Hampshire by Sunday afternoon. That front from Canada slips south and a wave of low-pressure will merge along the boundary, with a little rain or snow Sunday night and early Monday. We may get a coating of snow in the hills, otherwise the temperature should be warm enough so that any snow that falls will melt on contact. High temperature on Monday in the 40s early, before falling back into the 30s. Colder high-pressure takes over Tuesday and Wednesday, with highs in the 30s and low 40s, and nighttime lows in the teens and 20s. We may have a spot or two of record cold early Wednesday. It’s also mostly sunny through mid week, before the next warm front crosses northern New England with a shower Thursday afternoon. High temperature should bring 50° Thursday. We are then on the warm side of a Great Lakes storm, with temperatures in the 50s and 60s Friday to Saturday. A cold front on Saturday night generates some showers or a little mountain snow with clouds and perhaps damp weather here Sunday. Stay ahead of it with the First Alert 10 Day Forecast.